As a society, we are facing some hard truths. Recent global elections have surfaced the depths of frustration and despair many people are feeling. The profound lack of economic opportunity for those left behind by globalization has created an ever widening gap between the “haves” and the “have nots”. And voters have sent an unequivocal message: the status quo is no longer acceptable. Business leaders: this is our wake up call. We need to take a hard look at how we fit into this picture. Business – particularly big business – has played an undeniable role in creating this untenable situation. We are taking steps to address it. More businesses have begun to embrace their role as corporate citizens by partnering with governments and non-profits to effect change in their communities. So we are moving in the right direction. But we can do better. On the whole, the business community has still not stepped out of our comfort zone. We have elevated the importance of “giving back” on the corporate agenda, but we have not fully embraced it as fundamental to the way we operate. And that is what I believe to be the missing piece. Businesses need to start acting like we have skin in this game, because we do. The fact is, business cannot succeed if society fails. Consider the implications of operating a business in an environment where people don’t have the money to buy what is being sold; where growing inequities manifest in civil unrest and elevated crime rates; where people don’t have access to the education required to do the jobs that need doing. So, yes, we all have a moral obligation to the communities in which we live and work, but for the business community, this is also a matter of self-preservation. Are we continually looking for ways to take better care of our people? Are we doing enough to build the skills of the future? Do we have a business model that can do more than just deliver on the bottom line? Let’s consider the first question. We have all read news stories about businesses that have cut wages and reduced benefits. Are businesses really benefitting if their communities are suffering? It doesn’t seem like it. In fact, businesses are missing out on certain benefits because they’re not prioritizing the well-being of their people. Think about it: countless studies have shown that happier workers are more productive workers. So by taking better care of their people, businesses have the potential to improve customer service, enhance brand reputation, and change the way their people see them – as a career employer versus just a job. In the past year, a handful of leading banks and large retailers in the US have taken heed, increasing pay and benefits for their employees, with great results. Tony Jiang poses with his three children at his house in Shanghai September 16, 2013. At Deloitte, we too have stepped up our game in this area by introducing a new family leave programme. We now offer up to 16 weeks of paid leave annually to allow Deloitte professionals based in the US – both men and women – to focus on the needs of their families. This includes caring for a new baby, a sick spouse/partner or sibling, or an ageing parent. With the new programme, we can give our people the flexibility they need to continue pursuing career opportunities while managing their family responsibilities. This, in turn, helps us attract and retain top talent who contribute to better service for our clients. Moves like these obviously require an increased investment on the part of the company. But that is part of the shift in mindset I believe businesses need to make. We have to move beyond the instinct to prioritize the bottom line above all else. We must choose to do well by doing good. This leads me to the second question: are we doing enough to build the skills of the future? Many businesses have stepped up around the issue of talent development, investing in programmes designed to help people do their jobs more effectively and efficiently. But are we looking out far enough and wide enough? Given what’s on the horizon in the technology space alone, we know job requirements are going to change dramatically. Businesses should be investing now in training programmes to help people evolve their skills with the changing needs of the business. While we don’t yet know what the jobs of tomorrow will be, there are certain skills we know will transcend the test of time, such as critical thinking, effective communication, mathematics and science, and technological literacy. Siemens is an example of a company that clearly “gets it”. In 2011, they opened the world’s most advanced gas turbine manufacturing plant in Charlotte, NC. To create a pipeline of workers with the skills they needed, they partnered with a local community college to establish a three-and-a-half-year apprenticeship programme for graduating high school seniors. 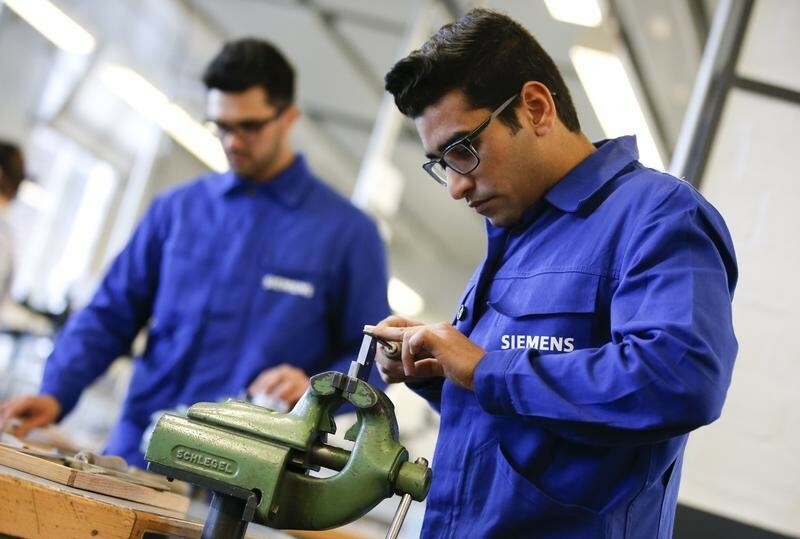 Students are given jobs with Siemens and expected to attend classes during their breaks. The programme not only encourages local workforce development, it fills Siemens’ talent pipeline with skilled employees, and provides on-the-job training for the jobs of today and tomorrow. And, just last year, Siemens took their efforts a step further by providing Clemson University in South Carolina with a $357 million in-kind software grant to help build a workforce qualified to take on the high-tech jobs of the future. One other important note on this. Skills-building opportunities should be extended to people outside of the mainstream talent pool. That might include at-risk youth, veterans returning to the workforce, or immigrants struggling to make a life for themselves in a foreign culture. The process for creating wealth must begin with creating opportunity for all. Refugees show their skills in metal processing works during a media tour at a workshop for refugees organized by German industrial group Siemens in Berlin, Germany, April 21, 2016. Finally, businesses must ask themselves whether they have a business model that can do more than just deliver on the bottom line. The best way for businesses to help close the wealth gap is to put their core competencies behind their efforts. Specifically, by creating a business model that intrinsically expands opportunity for segments of society that have been shut out of economic prosperity. Though it is admittedly more difficult for large, well-established companies to innovate within their existing business models, it is absolutely possible. Unilever, for example, has partnered with NGOs, governments, and banks to sell a highly portable, bio-friendly soap in India to promote hand washing in areas where sanitation is a constant concern. Initially 17 women sold the soap, creating a source of income and status for the women. By collaborating with local businesses on a microloan programme, Unilever expanded its network to 43,000, serving 3 million households in India. The questions I’ve posed are a start. Creating a fundamental shift in the way businesses approach their role in addressing societal inequities will take time. As a society, we need to refocus on creating an economy that works for everyone. I believe the business community is in the best position to lead the way.